Translated by George Makepeace Towle. Afterword by Peter Glassman. Barry Moser's sixteen exquisite watercolors capture Verne's beloved novel of suspense in this deluxe gift edition that will be treasured for years to come. A "handsome new edition...The translation is clear and sprightly." --New York Times Book Review. 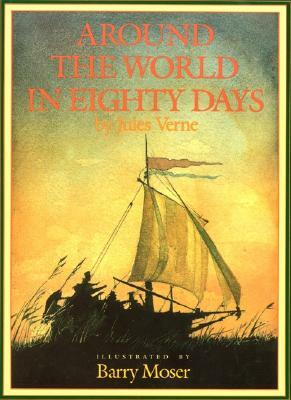 Jules Verne (1828-1905) used a combination of scientific facts and his imagination to take readers on extraordinary imaginative journeys to fantastic places. In such books as Around the World in Eighty Days, From the Earth to the Moon, and Journey to the Center of the Earth, he predicted many technological advances of the twentieth century, including the invention of the automobile, telephone, and nuclear submarines, as well as atomic power and travel to the moon by rocket. Barry Moser is the prizewinning illustrator and designer of more than three hundred books for children and adults. He is widely celebrated for his dramatic wood engravings for the only twentieth-century edition of the entire King James Bible illustrated by a single artist. He lives in western Massachusetts.